There’s a saying (or maybe more appropriately, a koan) traditionally attributed to Elvis Costello: Writing about music is like dancing about architecture. Though music critics often take the sentiment way too personally, it’s more about preserving the experience of art than it is pointing out the futility of any kind of art criticism: When we try to capture something engrossing (like listening to music, or reading a book, or watching a film) through means distanced from the experience itself, an essence of that art is bound to get lost. Something that isn’t meant to be adulterated is. By reading a description of music rather than listening to it, you are doing a disservice both to the art and to yourself, robbing your brain’s pleasure nodes of the experience as it was intended. Apparently. Which is why Sunshine Superman can be such a problematic film to love. 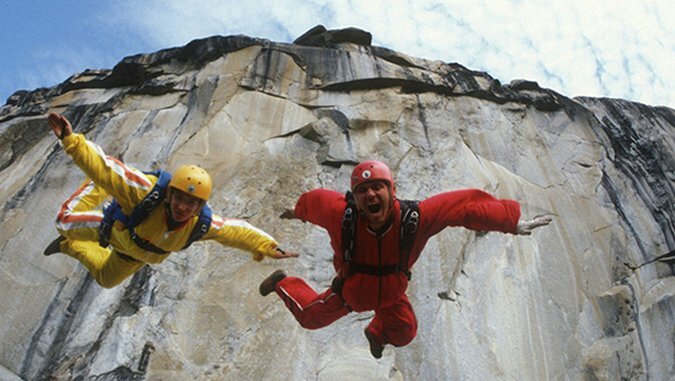 A thorough, intimate and often beautiful documentary about Carl Boenish and the BASE jumping movement that practically sprang singlemindedly from the endless font of his surreal enthusiasm, Sunshine Superman still can’t grasp the full splendor at the heart of the person and the extreme sport that serve as the film’s most plangent concern. And that isn’t necessarily the film’s fault—there is only so much excitement that can be conveyed regarding the freezing of a full-body rush into a small, albeit panoramic and easily gorgeous, picture—but it is something the film can’t get over. First-time filmmaker Marah Strauch spent years crafting something of a perfect eulogy to Carl Boenish—and her dedication to investigating his outsized life is palpable. It’s no real spoiler he dies, because although you don’t discover the details of Carl’s fate until the film’s final 20-minute stretch, his absence is heavy. His ghost is present everywhere else, though—in home recordings, in reel to reel recordings and even in answering machine messages, Boenish’s ebullient voice lives on righteously throughout the film. He considered himself as much of a filmmaker as a skydiver, or a jumper, or whatever it is you’d call someone who compulsively defied gravity for the sake of seeking the sublime, and so his trailblazing work with BASE (Buildings, Antennas, Spans and Earth) jumping is breathtakingly chronicled through the cameras he insisted festoon every jumper’s helmet. From his first experiments leaping from El Capitan in Yosemite National Park, to his illegal forays into parachuting from the tops of nascent skyscrapers in LA, Boenish left us with a wealth of mindboggling footage, and Strauch allows us access to it all. The way in which she is able to weave the choicest moments from Boenish’s films into a larger narrative that neither betrays the freedom of what he was doing nor feels too formless speaks to a film that seems well-crafted beyond its years. It can’t be stressed enough how purely stirring—and practically disturbing—Boenish’s footage can be, laced like amphetamines throughout the blood of Sunshine Superman. But therein is the film’s nearly fatal flaw: To watch this on anything but a giant screen is to neuter the exhilaration of what it was that Boenish so adored about the sport that eventually killed him. Yet, that’s Strauch’s burden, as it is the burden of any critic, or of any storyteller for that matter. How does one translate the purely visceral? First, she spent a huge amount of time befriending Carl’s widow, Jean Boenish, who Carl introduced to skydiving and BASE jumping during their odd courtship, and the one person, the film stresses, that mitotically shared Carl’s inimitable verve for life. When Strauch showed the film at the Portland International Film Festival in February, she commented that it took her quite a while to get Jean to agree to be in the film—and it’s easy to see why the film wouldn’t have existed without her. Far from simply spilling some behind-the-scenes details, Jean is the deceased Carl, insomuch as the way in which she muses on her life, and especially on Carl’s death, provides a strange—even unnerving—glimpse into the psyche of a person with an insatiable death wish. Or maybe a person who simply felt invincible. A Superman. It’s hard to tell which. The second way in which Strauch makes Carl Boenish’s insanity a very real experience for the audience is to never speak for him. Cursory explanations are offered for Carl’s adoption of skydiving and then of BASE jumping: He had polio as a kid, but spent the rest of his life leaping ever-further from his wheelchair; he was a consummate survivor; he was asexual until he met the perfect companion in Jean (in his 40s, no less), and so had a vibrant sense of fate flecking his purview. Strauch tells much of this in reenactments, yet even then her cinematic sense is impeccable—while the film may have been stronger without them (so powerful is the archival footage Strauch compiles), they’re still filmed with a sumptuous respect for Boenish’s already well-established voice. Carl Boenish knew what kind of filmmaker he wanted to be, and Marah Strauch seems to have finally given him the forum to fully realize that. Boenish’s death (in 1984) is respectfully addressed, in typically patient detail, though Sunshine Superman does shroud it in mystery by never once attempting to explain what was going through Carl’s head. He died, of course, by jumping from a part of the Troll Wall in Norway deemed to be much too risky to attempt. Jean Boenish offers no real insight—upon hearing of Carl’s death, its gruesomeness compounded by the fact that local authorities spent a day attempting to retrieve his body from the cliff face, her response was admittedly kind of alien—and all documentation of the event has been destroyed. Instead, we’re left with a vision of Carl before he decided to leave in the middle of the night to effectually kill himself: Interviewed by a young Kathie Lee Gifford, beaming with bonkers-ness, having just broken a world record jumping from a different part of the Troll Wall. Jean dutifully stands by, sharing wholly in his glory. It’s a simultaneously tragic and triumphant scene—and it is every bit the tone of Strauch’s film. Granted, the circumstances surrounding Carl Boenish’s death deserve no explainable answers, nor do they open themselves up to any. There is only the guilt of the people who led him to the top, and all of the people who loved Carl who still have no discernible reason for what he did. But then there is one more thing: Carl Boenish made films of his experiences BASE jumping in order to encourage people to do the same. He knew that a film was a slim facsimile of such an experience, and yet he believed in the practice, and he devoted himself to capturing the many stunts he threw his body into. He wasn’t making those home movies for people who knew well the experiences he portrayed; he was making those movies for the unconverted, for the fans, for the people interested, but who never thought they could ever do something like that. And in capturing that, Strauch may be dancing about architecture, but her choreography is some elegant, life-affirming stuff.